Don't worry these were bought before my spending ban lol. Maybelline colour show limited edition polka dot in speckled pink. Natio gentle foaming facial cleanser. I got a sample of this in my birch box it doesn't foam like i expected it too but it makes my skin feel extra smooth and cleansed. The sample did last around three weeks, after I cut the tube in half to get even more product out. Have never thought to do that before on any products so there's a money saving tip for you unless you already do it of course. This was in the beauty event sale at Debenhams for less then £5.00 with free delivery. I was actually going to purchase this using my Birchbox points when I got to £20.00 worth next month, fortunately yesterday someone clicked my referal link so I made the amount unfortunately this and another product I planned on getting had gone out of stock, I knew about the Natio cleanser going a few weeks ago so was gutted to find the other had gone out of stock too. So I decided to choose two others. So expect a haul coming soon (since it was free, this doesn't class as a part of my spending ban but the things I did get was very responsible and not got for the fun of it. I used my brain first. Look out for more on that coming soon) If you want to join Birchbox click my referal and Birchbox will donate £5.00 to charity http://birchbox.co.uk/?raf=9038 all purchases made in the e-shop at birchbox online they will donate a extra 30% and it's free delivery throughout May. I usually get the Sally Hansen nail polish remover but i decided to budget and go for something a little cheaper. That's where the Superdrug brand comes in. I think we all no what it does so I'm not even going to go into it lol. Finally my freebie in the 3 for 2 offer was a Barry M polish. I didn't get any of the new stuff that's come out recently and went for the black multi-glitter. I don't have any black polishes with a glitter to them and i know it's not exactly spring/summer but i don't care lol. On day one of my spending ban i was fortunate enough to win this from a Glamour Magazine competition. The body shop body butter in strawberry. I love my butters but never tried any from the body shop this is 200ml worth £13.00. It smells so good, remember them 5p chewing gums you could get with the juicy center that's exactly what the scents like. Yesterday was day two of my spending ban and i won this competition lol. I always win stuff when I'm on spending bans have not won anything since my last spending ban which was about a month ago. 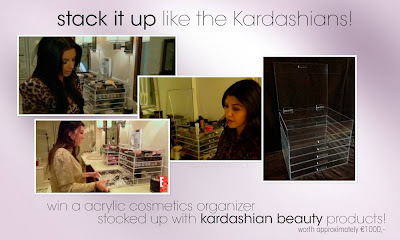 This is a Acrylic cosmetics organizer which will be stocked with the Kardashian beauty products worth approx 1000 euros which is around £900. I couldn't believe it they are to choose another winner at 15,000 likes over at their new facebook page here. Good luck if you enter. I can't wait to share with you what comes. I would be ever so grateful if people will take a minute to click on the Pendleside hospice on the right and donate towards this fantastic charity this will include the chance to participate in an amazing prize worth £50.00 you can donate via text too. All information can be found on the tab. Also if you love my blog i would love for you to vote for me in the cosmopolitan newcomer blog awards which can be found on the cosmo tab on the right. If you like my blog feel free to click the GFC, Google+, Bloglovin' and Twitter tabs. I'm also on she said beauty. I would just like to take the time to express my deepest sympathy to the solider who was taken in very tragic circumstances in Woolwich the other day. Drummer Lee Rigby of the 2nd Battalion the Royal Regiment of Fusiliers who has also serve in Afghanistan, much loved son, brother, husband and father to Jack (2) who will be missed. On the day he was killed he was wearing a help for hero's t-shirt since his death people have put together and set up a facebook page like here to pay your respects. Also the admin behind this set up a Just Giving sit to raise money to Help for Hero's which Lee was obviously very passionate about since then the public (people around the world) have raised over £90,000 via this just giving page here. This is just one page that's going on the Just giving site and the estimate donations that have flooded in since lee's death are nearing 1 Million. If you can donate please do. R.I.P <3 Thoughts are with family, friends and all loved ones. Omg congrats on winning the competition, can wait to see what goodies you receive in it!!! xoxo. Btw I hope your sis in law is alright. Oh dear, as long as she and the babies are fine and going to be fine. My waters didn't break, they had to break it as I was gonna give birth with the water sac. My son was 8 pounds 6 oz, a tall baby. I'm gonna be away for a few days, I'll catch up with you when I come back hun, xoxo. lovely pictures! I'm following you. I really hope you to the same!